I joined a seed trading group on Facebook called Seed Traders for Future Generations after hearing about it from Pammy over at Thyme Square Gardens. As soon as I joined, I was welcomed by several new members, and I quickly put together my list of available seed for trade — most of which was leftover seeds from the two orders I placed at Baker Creek Heirloom Seeds and Pinetree Garden Seeds this year. Within two days, I had four trades set up and new friends to annoy with photos from my garden. Seeds aren’t the first thing I’ve traded over the Internet. I also trade live music, but never sell it. This weekend on April 1, I was able to plant seeds from three of the trades while I planted seeds from the first trade on March 26. The first seeds to emerge were the Seashell Cosmos that I received first and planted first, as part of a trade from Anton, Texas. 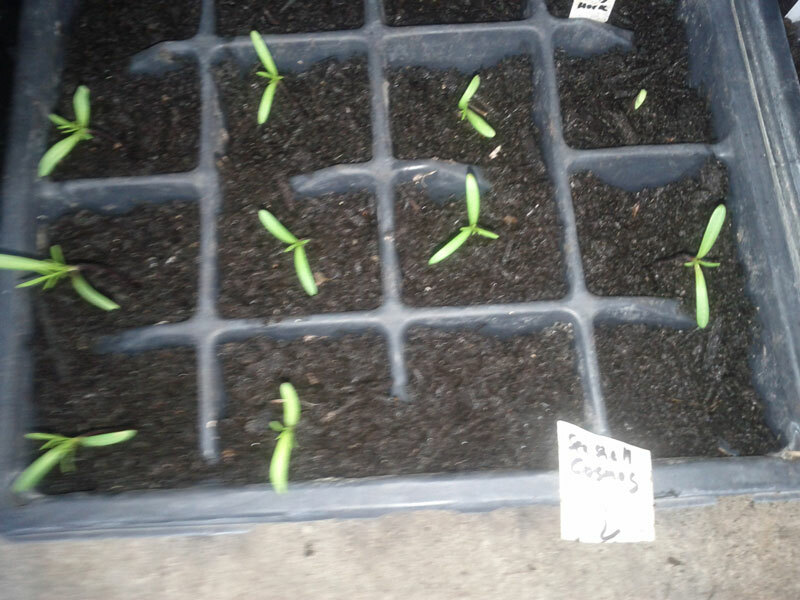 I can’t remember the first day they started to germinate, but it was less than a week after I planted them. What’s great about trading seeds is that, for little investment, I’ve doubled the varieties of seed I’m growing this season thanks to people who have mostly saved heirloom seed from previous seasons. Now, to learn about saving my own seed so that there’s less to buy next season — and more to trade. The next day, three more were starting to come up. How is you Roselle doing? Are you harvesting yet? Heh, not quite yet! I believe i have two or three Roselle plants scattered across the beds … I’m really looking forward to the fruit, though – I’ll try to keep you posted! Leaving only two varieties yet to germinate. But I believe they will soon.